Once in a blue note an album comes along which changes not only its own genre of music, but music itself forever after. No album of the 20th century is more responsible for turning the musical tide than Miles Davis’ 1959 release Kind of Blue. Not only is Kind of Blue an unprecedented, unabashed representation of a group of consummate jazz musicians, headed by its composer, trumpet player extraordinaire Miles Davis, but it also represents a pivotal moment of compositional and performing inspiration at the instigation of one of the foremost geniuses of jazz. In addition, the original, seminal recording features none other than John Coltrane on tenor sax, Cannonball Adderley on alto sax, Paul Chambers on double bass, Bill Evans on piano (apart from Freddie Freeloader), on which Wynton Kelly did the honours, and none other than Jimmy Cobb himself, Kind of Blue drummer, who, at eighty, knowingly heads the band who recreates that seminal recording for us tonight. To be at the Tower of London while consummate musicians re-enact tide turning moments originally performed by Cobb and other seemingly, boundary-less musicians was both awe-inspiring and humbling. To bear witness to such an enactment is a rare opportunity indeed, and one that I and those seated around me clearly and wisely relished. Musician/composer Miles Davis (b. 1926) was a cat with nine plus lives who had a way of shape-shifting both his music and persona over the years, always, miles ahead of his time. 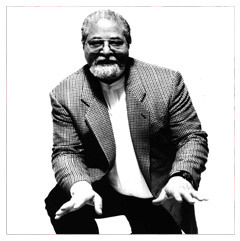 As a musician, he had an abiding interest in experimentation and innovation, so much so that in addition to changing the course of jazz by inadvertently inspiring the ‘Birth of the Cool’ and fusion, he also experimented with other genres, combining elements of many into his own expansive, ever-changing takes on music in general, even exploring the possibilities of hip-hop in the lead up to his untimely death in 1991. Multi-instrumentalist, widely known experimental saxophonist, Courtney Pine amiably opened the show with fine support from his fellow musicians on, among other things, selections from his 12th album, Transition in Tradition, in part a tribute to saxophone star Sidney Bechet. With 25 years of touring and a heap of experimentation under his belt, Pine was an appropriate opener for this show focusing on the ultimate moment in the history of jazz. As a black musician who was awarded a CBE for his outstanding contributions to the music world in the New Year’s honours of 2009, Pine is also a definitive representative of the burgeoning British jazz scene. 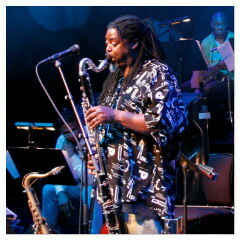 On this outing, along with his excellent band, Pine on his custom built extra long tenor sax offered some astoundingly agile notes, re-tracking some of the trajectory of his career via new and old compositions along the way, underscoring numbers intermittently with cool-hot Art Blakey, African, Latin, Reggae, French, film noir and you name influences in the mix, often with a sense of ironic melodrama and humour. At times, Pine’s sax even emitted subterranean sounds, a la didgeridoo gone urban and underground. Zoe Ramon (spelling as spoken) on piano was particularly impressive as she played, in one instance, with one arm pressing on a group of keys for emphasis, her long plat swaying against her back as she flashed smiles during the group’s jam-fest. Omar Puente was another strategic member of this group with his stunning violin work and shatteringly out there solos which seemed to say at one point, ‘What can I do?’ , in a prideful tone, as the lights behind him shifted into acid orange – a superb blend of skill and playfulness. Conversely, during another number Puente offered moments of plaintiveness as his violin shifted into a voice suggesting a summation of unavoidable suffering in a tour de force of expressive inspiration. Throughout, Pine’s imaginative playing kept things buoyant, often, via his apparent interest in world music, including Klemer, which originated from the ghettos of Eastern Europe. Pine, who handily switches from saxophone to clarinet, offered bassy ‘down the drain’ accompaniment for his fellow musicians on one number speeding up his ironic inflections on another, adding a sense of earthiness. All in all, Pine and company’s set was a wonderfully enjoyable, diverse and imaginatively executed one. Part two of this programme brought us the moments we’d been waiting for and then some, thanks to the musical intelligence, imagination and talent of Jimmy Cobb on Drums, Wallace Roney – Trumpet, Javon Jackson – Tenor Sax, Vincent Herring – Alto Sax, Larry Willis – Piano and Buster Williams on Bass, the latter two of which seemed, along with Cobb to be the senior seasoners of this seminal gumbo. But it was Wallace Roney in dark shades who held the key to our historic musical journey through his stellar playing, focusing our attention both back to Miles Davis in 1959, unknowingly setting the tone for vast, universal things to come, and on his own engaging performance in the present. Cobb, who performed alongside of Davis from 1957 – 63 acted as the resident guru who’d already been down the path, lending us the benefits of his accumulated wisdom in the here and now via his sticks and musical savvy. Younger member of the band, possibly the youngest, Javon Jackson shone in Coltrane’s highly polished shoes, rather impossibly, successfully reflecting on the man who made household songs like ‘My Favourite Things’ his very own. Herring on Alto Sax enacting Adderly also fit the bill like nobody’s business, and even a shoe horn couldn’t have come between him and his mission on his instrument. Williams on bass and Willis on piano are both jazz virtuosos; there is simply no way of telling where they leave off and their instruments begin. Willis rounded curves in the compositions on his piano much in the same way that race car drivers hug a curve, with complete focus and abandon, as did Williams, as evidenced by his ‘lost in the music’ body language and expressions. To say this set was inspiring would be a gross understatement. To confirm it as a dream set for those of us dreaming of such things, some of whom, like myself didn’t even realise that dream was part of their equation before they went there would be even closer to the mark. Kind of Blue is such an ultimate sound that once you’ve heard it somehow, changes you forever. Hearing it performed live in this way reconfirms that fact. The festival is an open air event and will go ahead regardless of bad weather.